For hiking and photography enthusiasts, there is no better place on the Great Wall of China than the dramatic and difficult Jiankou. As the most picturesque section of Great Wall, Jiankou is a popular destination for photographers, adventurous and experienced hikers throughout the year. At 991 meters, Zhengbeikou Tower is a spectacular sight and most photographed spot to enjoy the amazing views. Many beautiful pictures of Jiankou in guidebooks, videos, magazines are from Zhengbeilou. In the map below: (A) = Tian’anmen, Beijing. (B) = Xizhazi village at Jiankou. 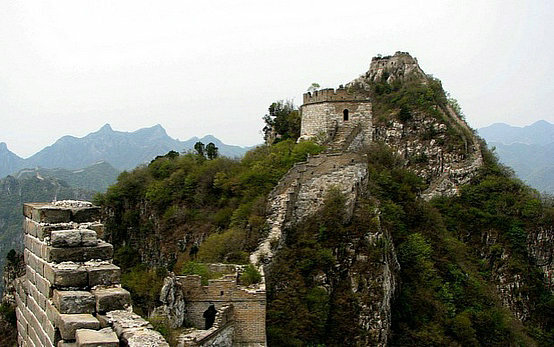 Initially built 1000 years ago, and largely reconstructed between 1568 and 1615 by patriotic General Qijiguang, the 20km long wall connects to Mutianyu to the east and joins Huanghuacheng in the west. As the collapsed ridge opening looks like arrow nock from afar, it got the Chinese name “Jiankou”. Divided into Back Jiankou (north side of Arrow nock) and Front Jiankou (south side of Arrow nock) by villagers, Jiankou stretches from the Nine Eye Tower in the northwest to North Sharp tower (Zheng Bei Lou) in the southeast with 22 towers. Getting to Jiankou requires at least a 2.5 hour drive from downtown Beijing on public transportation. To get there, take Bus No.916 at Dongzhimen, and get off at North street close to a roundabout, then negotiate with minivan drivers for a 150-200RMB round trip to Jiankou. Alternatively, at North street station, hire a taxi to Yujiayuan bus station (10 minutes on road), where you can take bus H25 to Xizhazi village of Jianou. Keep in mind that bus H25 leaves at 11:30 and 16:30 from Yujiayuan of Huairou. On the return journey bus H25 leaves at 06:00, 13:15 from Xizhazi village of Jiankou. If you prefer to make your way around Jiankou without the hassle of getting on/ off buses, hiring a private car from Beijing is a cost-effective alternative to bus ride. There are many scenic sites along the way including “Arrow nock” “The Sky Stair” “The Eagle Flies Facing Upward” “The Beijing Knot” “Nine eye tower” etc. 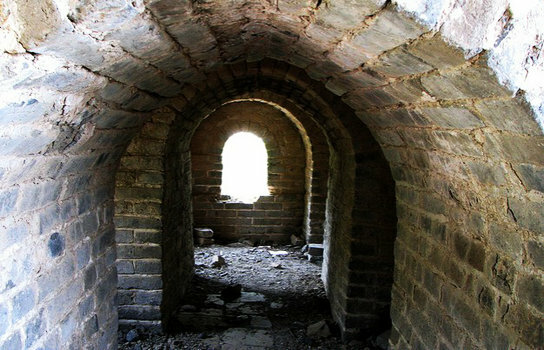 As a prominent fortification,Nine -Eye tower once served as the boundary between Huairou and Yanqing. With three floors,nine windows on each side, Nine-Eye tower has become a popular tourist site. Although some stairs have been added on the backside to enable you to climb up to the roof, the tower still retains its original appearance. As the meeting point for three walls coming from different directions, the knot is extremely dangerous as you have to use hand and foot holds to climb up. Even so, the route from Nine Eye tower to Beijing Knot is fairly safe, usually covering 3-4 hours on foot. Serious and experienced rock climbers may want to try this area, most would do best to avoid it. As a stair-like outcropping at an angle of 70 to 80 degrees, the famous Sky Stair is extremely difficult to get a foothold. You could hardly put your feet on because of the narrow stairs. People without professional climbing equipment won’t be able to make it. Many people are injured at the Sky Stair and some pay with their lives. This spot is an ideal place for mountain climbers. From Zhengbeilou, you can easily hike eastwards to Ox Horn Edge. The highest point on Ox-Horn Edge is1,044m. There are steep slopes with loose bricks and stones. Most would better to avoid Ox Horn Edge for the reasons of the safety. The village was little more than wasteland three centuries ago. In the face of China’s rapid modernization, Xizhazi village has only 180 families with the population of 400. The initial trail from Xizhazi to Zhengbeikou is hard to follow. Plants, grasses and large bushes grow here leaving only small paths to walk through. Jiankou is suitable for hiking with more wild scenery and steep way. Making your first step into Jiankou from the north on Zhengbeikou is a wise choice. For those who like trekking through the wilderness, a day trip of walking Jiankou (Zhengbeikou) to Mutianyu is perferct. The variety of landscapes will astound you: Jiankou basins, crumbling ruined wall, mountainous peaks; sheer rock faces. Start / Finish: Xizhazi village – Jiankou (Zhengbeilou) – Mutianyu. The starting point for hiking Jiankou is a small village called Xizhazi. Public transport is NOT available to Xizhazi from Beijing. A quicker, easier option is to hire a taxi or arrange private vehicle transport from Beijing. Generally takes about 2 hours to reach Jiankou. Route / Conditions : There are several different ways to get to Zhengbeikou. Climbing up from the north side is much easier although it takes longer time to get there. Climbing up is much longer and steeper from the south side, although it’s much easier to reach the south side from Beijing. Season: All year. Spring and fall offer fine weather. Winter can also bring clear skies, however, frozen snow and ice can make the walk difficult. Summer can be hot and hazy. Admission fees: Admission fee needs to be paid at either Jiankou or Mutianyu. Once you have Jiankou hiking plans, Minimize your preparations if planning on doing a small 4-5 hour Jiankou hiking. A multi-day Jiankou hiking is of course a totally different story. In general, the rule is: “Proper preparation for more enjoyments”. Keep in mind to wear comfortable, practical, and durable hiking shoes or boots with proper ankle support. Hiking shoes or boots protect us from possible damage to our feet. Hiking shoes or boots will serve you better than tennis shoes. Check out Clothing for visiting the Great Wall for clothing tips. For more hiking tips, see the article: How to Have a Successful Jiankou Hike.